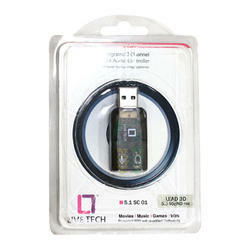 Leading Wholesale Trader of live tech 5.1 sc 01 usb audio controller from Mumbai. This Live Tech 5.1 SC 01 USB Audio Controller has provision for an integrated two channel and USB audio controller. Unbeatable Value For Money: We at LiveTech take Pride in offering the Maximum Value possible for Your money. Durable Build: Strict tests and Use of Quality Materials ensure that our products are built to Endure and Outlast. Easy to Use: No software or installation required, just Plug n Play. Quality Sound: Bringing you Best in Class Performance without breaking the bank. Sound Effects: Featuring 27 Environment Effects, 3 Environment Sizes and a 10-Band Equalizer.